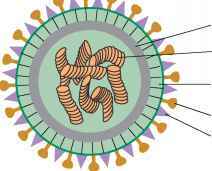 Figure 23.21 Diagrammatic Representation of Influenza Virus Note the surface structures, hemagglutinin and neuraminidase, the eight-segment genome, and the nucleoprotein, which distinguishes the three viral types, A, B, and C.
lope derived from the host cell membrane (figure 23.21). Projecting from the envelope are two kinds of glycoprotein spikes, hemagglutinin (H) and neuraminidase (N). 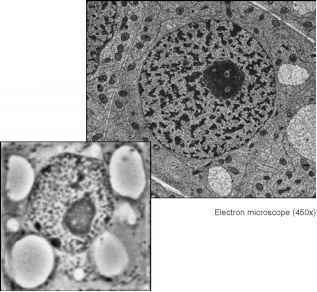 Hemagglutinin attaches the virus to specific receptors on ciliated epithelial cells of the host and thus initiates infection. Neuraminadase, on the other hand, is an enzyme that destroys the cell receptor to which the hemagglutinin attaches. This aids in the release of newly formed virions from the infected host cell and fosters the spread of the virus to uninfected host cells.